Come out and take a look at this beautiful serene water front piece of land with a gorgeous view of the lake. 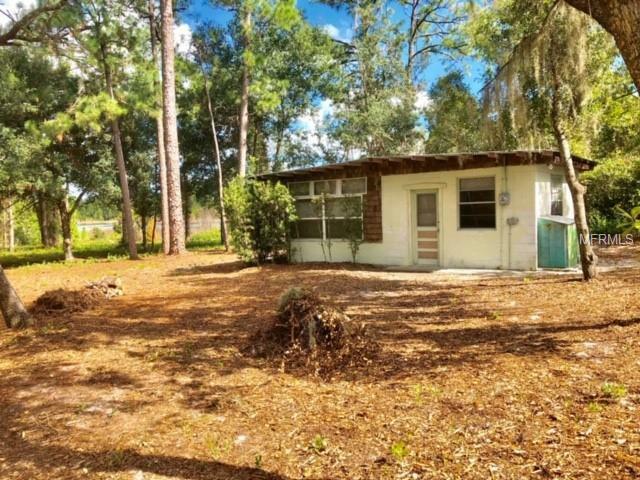 With 5 acres of private land to build your dream home or you can take advantage and live in the little concrete block cottage on the property. The cottage has electric, a well for water and septic for sewer. The kitchen has a small sink, a stove and a refrigerator. With a couch, pull down murphy bed and small table what more do you need for your Lake House Retreat in the woods. Live in the cottage or use it while building your home or even use it as an In-Law-Suite. Endless possibilities. Private gated entrance to the Lake front property. Sit outside in the morning with the view of the Lake and enjoy your morning cup of coffee while you listen to the peacefulness and feeling of living out in the country. Conveniently located near shopping, restaurants and Medical facilities. You have all the conveniences near by. You are not far from I-4 and only a 30 minute drive to the beaches and 1 hour drive to Orlando. You have to view this beautiful piece of land to appreciate what possibilities it has to offer you. Don't wait, make an appointment today to come out and take a look.